How many of your guitar skills can you use ‘fluently’ when creating, improvising or playing a guitar solo? I’m not asking about ‘how good you are’, ‘how much you know’, or ‘what you can play’. I’m asking you to think about how well you can ‘use’ the skills you already have to your fullest expressive potential. For most guitar players there is a huge gap between what they can play and what they can play fluently, creatively and expressively. Unfortunately, most guitar players struggle with this for years because they don’t understand (or aren’t willing to do) the things that would really enable them to create consistently great music with the skills and knowledge they already have. Instead, most simply try to acquire new skills and do not seek to go deeper by learning more about the skills they already have but have not yet refined. In the video below, we will focus on how to ‘use’ what you know and how to get a lot of cool sounds and emotion out of playing very few notes on the guitar. The more you learn how to get a lot from little, the easier it is for you to get a lot from a lot. When creating or improvising guitar solos, most guitar players rely on ‘playing new notes’ (or more notes) in order to express themselves. This rarely works well. The key to creating, improvising and playing great guitar solos is not ‘what’ you play, it’s ‘how you play it’. Having great guitar phrasing is infinitely more valuable than having other great guitar skills. There are many ways to learn guitar phrasing, but the most important is to be able to play one note extremely well. Another great thing to practice is to make many small variations on a small single phrase. You want to focus not on what to play, or what the note options are, but instead on what you can do with a small phrase. How much emotion and interest you can squeeze out of something small. 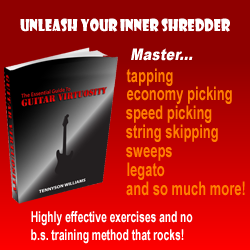 Train your lead guitar skills by working with ‘less’ notes, so that you can master the ability to become fully expressive using all the notes, techniques and skills that you can already play, instead of working on ‘new skills’. You can sometimes grow faster as a guitar player by learning more about your ‘existing’ skills instead of learning new ones. Training with a very small group of notes is one of the key methods you can use to do this. Watch the lead guitar lesson video below to see exactly what I’m talking about and learn how to improve your lead guitar playing. It’s interesting, but I’ve never realized how similar improving specific guitar skills is to speaking a language…there is a huge difference between players that can get the “words” out (play the scales methodically), and those that can “fluently” speak the language (expressively and creatively utilize the skill to improve the quality of their playing.